I wanted to have a nice blog about spring and the Easter holiday. I thought I’d share pics of bunnies and maybe baskets filled with eggs. Instead, my husband and I wake up to the below. 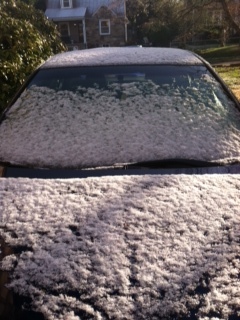 How is it possible to have a coating of snow 5 days before Easter? It boggles my mind. Then I read on the internet that another state was hit with a snow storm on Monday that shut down there 311 response system. 🙁 Doesn’t sound very spring like for sure! Fingers crossed that old man winter goes away. If anyone ants to send me spring like pictures of flowers and bright green grass, feel free 🙂 I could use the pick me up. LOL. We only had sleet here but the temps were below freezing. No snow here but it’s in the 50s which is practically the same thing in Florida. I had to get my coat, gloves and earmuffs back out. Go away winter!